This chapter applies to both DTL transformations and custom transformations. Select the transformation and click Test on the Data Transformation List page. For HL7 or other EDI messages, the window displays raw text; have some saved text files ready so that you can copy and paste text from these files into the Input Message box. For regular Ensemble messages, the window displays an XML skeleton with an entry for each of the properties in the message object; type in a value for each property. Review the results in the Output Message box. 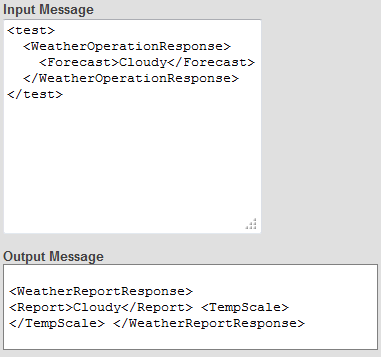 Create an instance of the source message class. Set properties of that instance. source is the source message. target is the target message created by the transformation. Create an instance of %XML.Writer. Optionally set the Indent property of that instance equal to 1. This adds line breaks to the output. Call the RootObject() method of the writer instance, passing the source message as the argument. Repeat with the target message.